Luxury living beckons the buyer with discerning tastes to Trilogy at Monarch Dunes 5 Star Golf Course Resort. Captivating high-end remodel inside & out in 2014 for over $350K, this single story, solar-powered 3,232 sq. 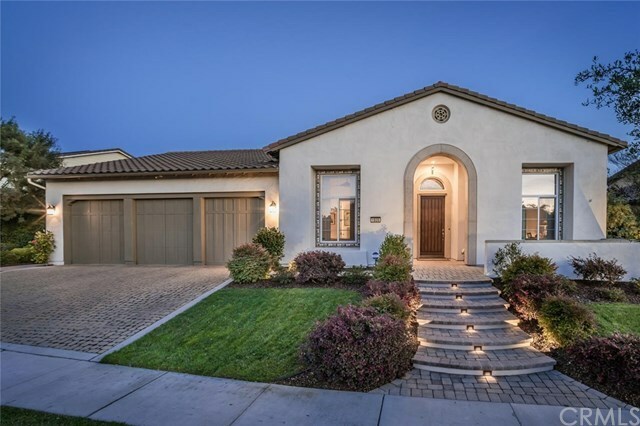 ft. Junipero has 3 bedrooms, 3.5 Bathrooms, 3 Car Garage with custom cabinets/epoxy floors. 180 degree panoramic lake, golf course & backyard views from the Gathering Room, Gourmet Kitchen, Informal Dining Area, Great Room & Master Bedroom Suite. Enhancing the exterior are new front & side walkways, steps with low voltage lighting & driveway pavers. Backyard patio redesign includes triple waterfall fountain, tile decking, benches & gas fire pit, Pergola/trellis/pillars and perimeter & landscape lighting with Bromic ceiling mounted heaters. Two spacious Guest Bedrooms on each side of Foyer with Ensuite Baths. Elegant remodeled Dining Room. French Doors invite one to explore richly paneled bookshelves in the Library. Stunning fireplace offers warmth in the Gathering Room. Lofty ceilings & multiple windows compliment the gracious open floor plan. Sensational Kitchen boasts a Thermador 6-Burner Gas Professional Stove top, Quartz slab radius counter, stainless steel appliances, cherry cabinetry & Butlerâs Pantry. The informal Dining Area provides optimum viewing pleasure of the reflective lake. Home Theater & Surround Sound. Exquisite remodeled Master Bedroom EnSuite, bath & walk-in 3 tier closet. This exceptional Estate Home is one of Trilogyâs finest.